This entry was posted on January 11, 2012 by Sean Kane. 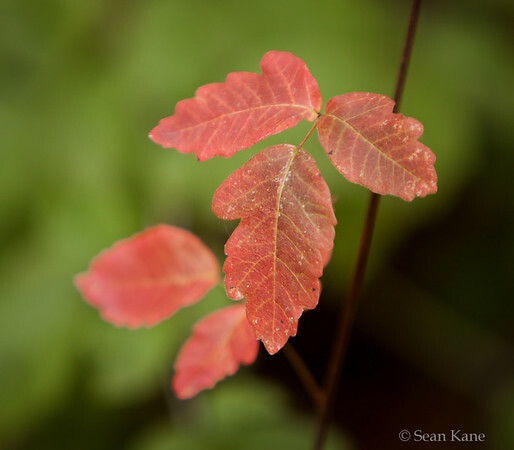 It was filed under Flowers & Plants, Photos and was tagged with Photography, poison oak. My husband is seriously allergic! You have some nice detail here, Sean, however, I am finding the strong vertical (okay, with a slight diagonal) stem in the background to be drawing my attention away from the sharply focussed leaves. If I cover the stem with my fingers, the leaves instantly POP off the screen. If you moved a little to the right, the stem would probably have then been out of frame and wouldn’t intersect that top leaf. I’ve run into thisa before and sometimes, I’m able to move or cover elements like this with background leaves so they fade away. You coudl also fade out or clone out the stem in post.